Toilet training is a developmental milestone that many parents will remember for their children for the rest of their lives. Though some parents seem to think that toilet training is a competition – whose child can be trained earliest whose child will catch on the quickest – this should never be the case. Each child will display a unique ability to be toilet trained when the time is right for them and no one else. Although there are ways for you to monitor this readiness, it would be unwise to attempt to proceed with toilet training before you see signs that your child has a chance of succeeding. Readiness for toilet training will require both physical and mental abilities in each child. Physically a child must be able to hold in urine for several hours, though this will only occur when his/her bladder muscles have developed to an extent that will allow him/her to “store up” this liquid. Mentally the child must also be able to differentiate the signs that they are in need to use the toilet. Not only will the child need to recognise the physical clues that they need to urinate (or defecate), but they will need to recognise them before they complete these actions. In short, not only must a child be able to “hold it” until (s)he reaches a toilet, but (s)he must also be able to interpret the physical clues that will motivate him/her to find the toilet in the first place. If their child’s nappies remain dry for several hours at a time. If their child announces when (s)he needs to urinate or defecate. If their child shows an interest in the toilet. If their child shows a frustration or dislike for their nappies. If their child shows an interest in grown-up underwear. If their child shows interest in other children who have been toilet trained. Make a special outing of buying a child’s potty and allow their child to pick it out. Allow their child to play with the potty and sit on it fully clothed when they so desire. Explain the toilet/potty to their child and allow their child to flush it several times to get used to the noise and/or action. Ask their child if (s)he would like to attempt to use the toilet – and proceed only when their child seems interested. Allow their child to look into the potty or toilet bowl after a successful event. 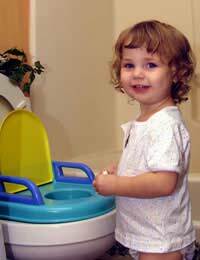 Stop toilet training for a little while if it has become frustrating or scary for their child. There is no harm in taking a “breather” and starting up again later. Investing in “pull-ups” or other nappies designed for older children who are toilet training, just in case. Toilet training is a process that will occur uniquely for each child. Parents should never rush their child into toilet training or an untold number of tears and seemingly infinite amount of frustration could result. Instead, parents should watch for signs of their child’s readiness and discuss the toilet with their child before proceeding with any toilet training regime. If a child is ready and motivated to become toilet trained, odds are that the process will progress much more smoothly than it might otherwise. @jo - sometimes children don't understand the importance of eliminating when nature calls and if they can learn to put off going to the toilet they tend to do so often and for as long as they can. As the article says, toilet training is a process that will occur uniquely for each child. Parents should never rush their child into toilet training or an untold number of tears and seemingly infinite amount of frustration could result. Instead, parents should watch for signs of their child’s readiness and discuss the toilet with their child before proceeding with any toilet training regime. If a child is ready and motivated to become toilet trained, odds are that the process will progress much more smoothly than it might otherwise. It's hard to advise without knowing the full extent of the situation and to what extent she will go, but if you are concerned then perhaps you could visit to your GP for some extra advice.